While the Chevrolet Corvette has always been known for its sharp exterior lines and high performance drivetrain, the naysayers have often harshly criticized the bowtie clad sports car for the lack of interior luxury. In the early days of the Corvette, the interior was as high end as most buyers could expect as there was very little competition but as the Corvette got into its 4th generation in the 1980s and 1990s, critics began hammering the Vette hard for just not offering a fancy enough interior. For lack of a better explanation, the Corvette interior was just “too Chevy” - with flimsy plastic on the dash and doors, uncomfortable seats wrapped in leather of questionable quality and sound systems that fell far short of the competition. This shouldn’t come as too much of a surprise considering that Chevrolet has always been a bargain brand but both critics and buyers have demanded that the Vette features a high end interior spread to match the high end pricing. Things improved quite a bit with the introduction of the C5 and continued to improve with the C6 but with the introduction of the C7 Corvette Stingray – General Motors finally has a sports car with an interior that will compete with the likes of the Jaguar brand rather than having an interior that would be more comfortable in the far less expensive Camaro. Sure, the Corvette is a sports car above all else but in the modern sports car segment in which the 2014 C7 Stingray will compete when it arrives later this year, offering a comfortable, luxurious setting packed full of high tech goodies and high end finishes is every bit as important as how fast the car will dash down the quarter mile. 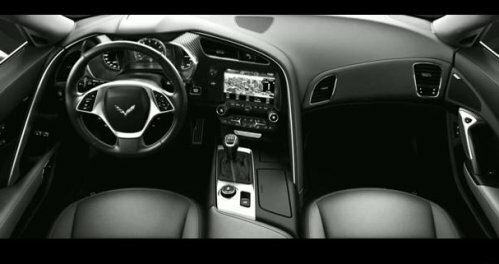 It was with that simple fact in mind that General Motors designed the cabin of the 2014 Corvette with an emphasis on high end finishes and materials without departing from the cockpit-like sports car feel that Corvette buyers expect. Finally, the Corvette is a supercar with a supercar interior and the new GM issued video below walks us through the design process of the C7 Stingray cabin. This new video focuses on aspects of the 2014 Chevrolet Corvette Stingray Coupe interior beginning with the plush leather chosen to cover the seats, shifter and other portions of the interior with hand stitched seams throughout accentuating the high end look of the C7. Next, GM highlights the gorgeous customizable gauge cluster and the big, bright touch screen controlled infotainment screen that is mounted high on the center stack. We also get a good look at the various carbon fiber appointments on the dash (an aspect that bolsters the supercar feel) that are located in places where older Corvettes would have had plain, boring plastic. Among the most important features of the 2014 Chevrolet Corvette Stingray interior are the new seats with two different options for the buyer – both of which are right at home in a sports car of this caliber. First, the standard seating option is the new “GT” seat (check it out around the 2:17 mark in the video below) that has deep hip and side bolsters for great grip under hard cornering without compromising comfort while the optional “Competition” seat looks like something straight out of a race car with deep bolstering from top to bottom... plus openings around the driver’s head that look perfect for a race style harness. Having had the pleasure of sitting in both of the C7 seat options, I can attest that they both seem more comfortable than past Corvette seats while the GT seat serves as a complete sports car seat where the Competition option is ideal for those who want a real race car feel in their C7.